Exchanging vows on a Caribbean beach? Tying the knot in a medieval city? Destination weddings can create a once-in-a-lifetime experience for both you and your guests, but they require some extra planning and consideration along the way. Check out our tips for planning a destination wedding before you say “I do” to a wedding away from home. The prettiest destination doesn’t always make the best wedding. Try to pick somewhere that’s relatively easy to get to and won’t cause too many passport, language or cost-prohibitive barriers. Harmony Walton, founder of the destination wedding blog Jet Fete, suggests considering “the ages of your guests, weather and heat conditions, as well as current regional issues like Zika [virus] and how that may impact your RSVP’s”. You may even want to run your idea by the wedding party and VIP guests before you settle on your location. Every country has different rules and requirements for marriage licenses. Contact the embassy, consulate or tourist office at your destination to make sure you don’t run into any trouble. Inquire about what documents are necessary, how long it takes to process paperwork, and if there are any different requirements for religious versus civil ceremonies. Some countries also have residency requirements that dictate how long you have to be in country before a legal wedding can take place. Most places require just a few days, but some countries require a longer stay before your wedding. France, for instance, requires at least one of the parties getting married to arrive 40 days before the wedding! 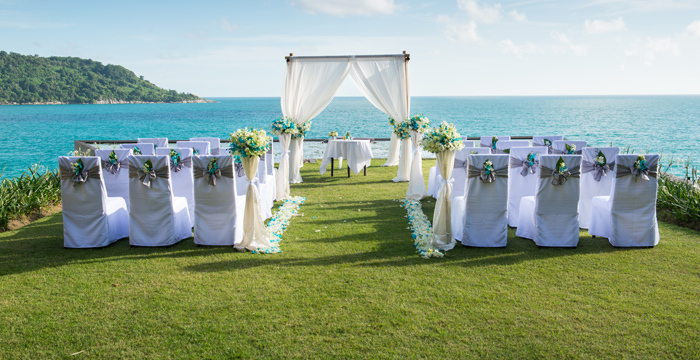 Some destinations require event permits, especially if you’re thinking about exchanging vows at the beach. Check for ordinances that require you to pay more to have a certain number of guests, privacy barriers, food and alcohol or bonfires. While certain destinations have per-hour permit rates, others have a flat cost per ceremony. Ask the local government what regulations are in place for events and gatherings at your destination and secure any legal documentation ahead of time. Choosing between local or from-home vendors can be a dilemma. Finding local vendors may be legally and logistically challenging, but flying your own vendors out for the wedding can be prohibitively expensive. Either way, it pays to do your homework. “Ask for past bride references before booking vendors, check their reviews, and look over your contract very thoroughly” says Jenn Hallak, owner and editor of The Overwhelmed Bride. “Believe it or not, many contracts actually leave wedding date and location information out!” Read each contract a few times and study up on local tipping norms for a smooth process from start to finish. Destination wedding planners and companies often offer packages to handle the hard stuff for you. Claire Byrne, editor of BridalMusings, recommends hiring the planner. “You might be very capable, organized, and creative, but getting married abroad is supposed to be more fun and less stressful than opting for the conventional big wedding at home,” she says. Hiring a professional planner who can haggle a good deal and source local vendors can save you not just a hassle, but time and money too. Just because you’re getting married far from home doesn’t mean it has to break the bank. It’s still important to set and stick to a budget, and looking for group rates can be a good way to save. Ask for a block of rooms at the hotel and try to arrange group rates on flights so you and your guests can all score some discounts. If you’re headed abroad, make sure you also factor in the exchange rate at your destination as you meet and negotiate with venues and vendors. Some guests may feel burdened by a destination wedding invitation because it’s more expensive and time-consuming than typical nuptials. Jessica Bishop of The Budget Savvy Bride suggests inviting guests “at least six months prior to the wedding date,” giving them plenty time to plan, save money, or make the necessary travel arrangement to attend. Harmony Walton recommends being “as detailed as possible about hotels, airport transfers, activities and even packing suggestions.” This can put guests at ease and “limit the number of questions, calls, and texts you’ll get in the weeks and months leading up to your big day.” The less your guests have to worry about logistics, the more excited they’ll be to attend your wedding. A good destination wedding is more than just the ceremony and reception. In addition to your normal requirements as bride and groom, you’re also responsible for helping your guests make the most of their trip. Along with routine details like how to get there and where to stay, your wedding website should include local information like the best places to eat and must-see nearby attractions. A welcome bag for guests on arrival with area-specific vouchers and supplies is a nice touch. The more insider knowledge you can bestow, the better. Last but not least, don’t let the distance of your wedding venue add stress. Plan as best you can and be willing to accept a few bumps along the road. All weddings have them. But if you plan properly, your destination wedding will be an event — and trip — that you and your guests will never forget.